The Sharps Recovery System is a USPS-authorized medical waste mailback system. 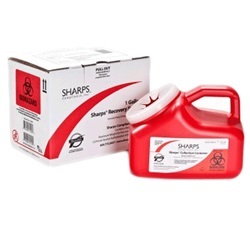 This cost-effective services provides a red sharps container and a comprehensive, prepaid mailback system to properly dispose of sharps and other small quantities of medical waste. Systems include a primary collection container, prepaid return shipping box, components to package for transport, waste manifest tracking form, instructions for use, proper treatment and online documentation of treated waste. All systems are uniquely serialized for tracking and provide complete cradle-to-grave compliance with local, state and federal regulations.